Today, Electronic Arts Inc. (NASDAQ:EA) released the official EA SPORTS Madden NFL 19 Super Bowl LIII simulation, predicting a big win for the Los Angeles Rams as they walk away Super Bowl Champions and defeat the New England Patriots 30–27. Aaron Donald received the MVP award following a record-breaking Super Bowl performance in which he tallied four sacks. Aaron Donald finished his dominant season with a Super Bowl record four sacks to cement his first MVP award. 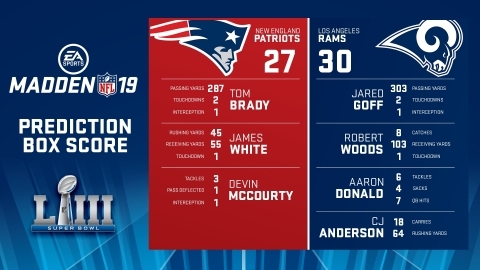 Other player highlights included Jared Goff topping Tom Brady by throwing for 303 yards to Brady's 287 yards, while both garnered two touchdown passes and one interception. Patriots wide receiver Julian Edelman and Rams wide receiver Robert Woods both hauled in 8 catches and one touchdown for a total of 104 and 103 receiving yards respectively. Pats running back Sony Michel was the top rusher with 103 yards and touchdown, while no Rams player rushed for more than 100 yards, with running back C.J. Anderson maxing out at 64 yards on 18 carries.